Franklin Roosevelt was the 32nd President of the United States who served in office from March 4, 1933 to April 12, 1945. What was the life of Franklin Roosevelt like? The short biography of President Franklin Roosevelt covers important information and facts about his early life, his family, career and the famous events and achievements of his political life. Our short biography of Franklin Roosevelt provides an interesting and easy way to learn about the life of the President. The following important facts provide a fast overview of important facts about President Franklin Roosevelt. Facts and Info: Franklin D. Roosevelt was the 32nd president of America and the only president to serve more then two terms. He led the nation out of the Great Depression and towards victory in World War II. For additional info refer to 20 Facts about Franklin Roosevelt. Facts and Info: He was born on January 30, 1882 in Hyde Park, New York. He came from a wealthy New England family of landowners and businessmen and was a distant cousin of Theodore Roosevelt, the 26th US president. 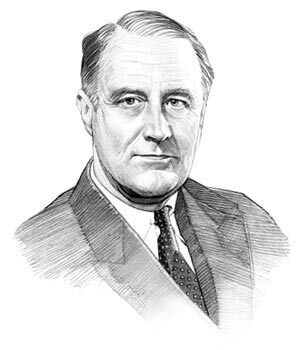 Franklin D Roosevelt died on April 12, 1945 (aged 63) in Warm Springs, Georgia. Facts and Info: The career of Franklin D Roosevelt included the roles of Lawyer, Politician and Statesman. He received and excellent education attending Harvard College and Columbia Law School. He became the 32nd president of America in 1933 and served for 12 years until 1945. Facts and Info: Franklin D Roosevelt married Anna Eleanor Roosevelt on March 17, 1905. Eleanor preferred to be called by her middle name. She was the fifth-cousin once removed to her husband the niece of president Theodore Roosevelt. Eleanor and FDR had 6 children. FDR was stricken with a paralytic illness in August 1921, 16 years after his marriage, which resulted in permanent paralysis of his legs which was believed to be polio. Franklin D. Roosevelt belonged to the Democrat Political Party. He was 51 years old when he was inaugurated as the 32nd president. Inauguration is a president's swearing-in ceremony. He was the only president to serve for four terms and the only president who was confined to a wheelchair, although he concealed his paralysis from the public as much as possible for political reasons. Facts and Info: Franklin D. Roosevelt belonged to the Democrat Political Party. He was 51 years old when he was inaugurated as the 32nd president. Inauguration is a president's swearing-in ceremony. He was the only president to serve for four terms and the only president who was confined to a wheelchair, although he concealed his paralysis from the public as much as possible for political reasons. Garner and Wallace stood as Vice presidents. For additional facts refer to his Presidential Cabinet members. Short Biography of Franklin Roosevelt: What he was like! Facts and Info: Franklin D. Roosevelt was 6 feet 2 inches in height and weighed approximately 182 lbs. He had brown hair, grey-blue eyes and a fair to ruddy complexion. During World War II, president Roosevelt served as Commander-in-Chief of the United States Armed Forces. He enjoyed his hobby of saving stamps, not for their value but because of their link with geography and history. Franklin Roosevelt was the first president to have his own airplane. Facts and Info: Some of the important events which occurred during his presidency were the FDR New Deal policies that brought about the beginnings of a national recovery. He was president during World War II which lasted from 1939-1945. When Pearl Harbor was attacked in 1941 the US entered the war. He was instrumental in the Yalta conference in February 1945 where Roosevelt, Stalin, and Churchill planned the final stages of World War II and agreed to the territorial division of Europe. Facts and Info: During his life Franklin D Roosevelt suffered from various illnesses hypertension, haemorrhoids, a sebaceous cyst and angina. In 1921 Roosevelt contracted polio at the age of 39 years old. Facts and Info: President Roosevelt died of cerebral hemorrhage on April 12, 1945 during his 4th term as president. He died at the Little White House in his cottage at Warm Springs, Georgia, the rehabilitation center for the treatment of polio that he had founded. He was buried in the Rose Garden at his estate in Hyde Park. The short biography of Franklin Roosevelt provides a fast overview of the key facts and events about his life and the accomplishments of his presidential term in office. The following Franklin Roosevelt video enables you to sit back and listen to the history of his personal and political life - a useful educational resource for kids, children and schools learning about the life of President Franklin Roosevelt.